Commercial (store bought) patterns can sometimes be tricky to use, and if we’re not thinking all the while we’re cutting and sewing, we could be setting ourselves up for errors and mistakes and ending up with a garment that won’t fit. Here are a few tips to help keep those errors at a minimum. * When using a pants pattern the first time, it is wise to make 1″ seam allowances rather than the usual 5/8″ — this will allow a little extra for fine-tuning the final fit of the pants. *When using one of the “multi-view” patterns, it will be much easier to locate the individual pieces needed for a certain view if you will first re-fold the pattern pieces so that the “view” number or letter is facing out. 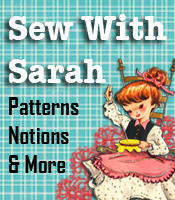 *To transfer an exact dot from a pattern to the fabric, make a small cross over the center of the dot. *Since the bodice of most dress patterns is the most difficult to fit, it is wise to choose your dress pattern size according to the bust measurement and make the necessary adjustments to the skirt. *If you extend the grainlines on your patterns all the way to the top and bottom of the pattern pieces, it will give you greater accuracy when you begin cutting. * Raglan and dolman type sleeve styles flatter a small bust, as well as helping to minimize heavy arms and broad shoulders. If you have other pattern “tricks” to make cutting and sewing easier and quicker, we’d love to hear from you, so we can post those tips for our readers.